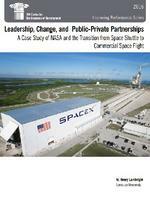 A Case Study of NASA and the Transition from Space Shuttle to Commercial Space Flight. partnership strategy, from its formulation and adoption during the George W Bush Administration to its augmentation and fulfillment under the Obama Administration. In the past decade, NASA has seen the shuttle retirement, completion of the ISS, the start of a commercial cargo and crew service to the ISS, the end of one major rocket development program, and the decision to develop a different, giant rocket capable of taking astronauts and cargo to deep space—the Moon, an asteroid, and eventually Mars Indeed, viewed historically, NASA and its political masters have initiated and sustained a transformative decision-making process for human spaceflight exploration, with Mars as a destination. A prime reason that NASA has sought innovative public-private partnerships in the evolution of the shuttle program involves current fiscal realities. Ultimately, NASA wants to concentrate its limited resources on deep-space exploration and cede lower-Earth orbit to a burgeoning commercial space sector. Achieving these two goals requires transformational change. The shuttle successor partnership with the private sector can initiate such change. This is indeed a case about transformative change—a radically new way of performing an existing government task. Leadership, Change, and Public-Private Partnerships: A Case Study of NASA and the Transition from Space Shuttle to Commercial Space Flight is the seventh report prepared by Professor Lambright for the IBM Center. In 2012, Professor Lambright identified two outstanding government leaders, Robert Gates and Dr. Francis Collins, who both led transformation initiatives in their organizations. Lambright’s research for the IBM Center also includes leadership case studies of three recent administrators of the National Aeronautics and Space Administration: Dan Goldin (2001), Sean O’Keefe (2005), and Michael Griffin (2009). We hope this new report will provide insights to present and future government leaders seeking to transform their organization through the pursuit of public-private partnerships and other new initiatives to address changing missions.